Jacques Barzun (1907-2012) was a renowned social historian of the last century whose interests spanned much of American popular culture. 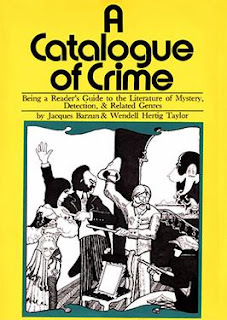 His 1971 work A Catalogue of Crime, (written with Wendell Hertig Taylor) was a landmark study of the works of the literature of mystery and crime fiction, containing over 5,000 entries on novels written in the genre. But as important as this book was in the field, it had its detractors -- many who disagreed with his opinion of certain books and others who took exception to his very understanding of what crime fiction was and what it represented. The above quote, taken from the book’s introduction (or more specifically, the “Introductory,” as it was titled) seems, to the fan of John D MacDonald’s Travis McGee series, to be a direct aim and fire at the author. When a paper written for 1978’s John D MacDonald Conference on Mystery and Detective Fiction, held at the University of South Florida in Tampa, brought up Barzun’s assertion, MacDonald responded. [The writer of the paper] uses the Jacques Barzun dictum that “anyone who attempts to improve on the mystery genre and make it a real novel suffers from bad judgement.” He [Barzun] further claims that replacing clues with psychology and sociology is “childish tinkering with the genre.”... This strikes close to home, as anyone would know who reads the McGee books, Any writer who claims that he is writing a suspense story and at the same time writing more than a suspense story is open to a justifiable criticism of pretentious jackassery. I know what I am trying to write. I am accepting the strictures and limitations of the medium and then, within those boundaries, trying to write as well as I am able, of the climate of the times and places in which the action takes place. I try to put violence into its contemporary frame of history, believing that not only does this make the people more real, it makes their actions more understandable. On page 45 of the Fawcett edition of One Fearful Yellow Eye, I have McGee’s interior monologue about Chicago women, slums, Hefner and professional sports. I did it because I felt then, and still feel, that the flavor of the city and its times is essential to an understanding of what had happened there to Doctor Geis. I do not accept Barzun’s ground rules. No one can tell me that it is not within my authority to try to move my suspense novels as close as I can get to the “legitimate” novels of manners and morals, despair and failure, love and joy. There are no ground rules. The only stipulation is: Does it work? And this, too, is an empty question, because any book, any author, will work for some and not for others. Any creative form presupposes a selective taste, just as the taste of the author, painter, sculptor or composer uses his own selective taste in the elements of his finished work. At any rate I shall continue with my sociological asides, with McGee's and Meyer’s dissertations on the condition of medicine, retirement, education, facelifting, ear mites, road construction, white collar theft, apartment architecture, magazine editing, acid rain, billyrock, low fidelity and public service in America today, permitting a certain amount of wandering, but subjecting it to the blue pencil when it begins to feel as if it has gone on too long. The odd thing, I suppose, is that I find it easier to do this sort of thing in a medium where it is not all that customary than to do it in the novels I write which are not in the suspense genre.